Tiny & Big in : Up that Mountain is an innovative Physics based game for Linux with a very artistic visual style. The game features hand drawn textures and highly appealing comics-like cel-shaded graphics. You are Tiny, a technophile guy with a ray cutter, a gripping device and a fine attitude towards the world. But now your nemesis Big stole the only heritage your grandpa left you: A nice pair of white, fine rib underpants! So you load up that self made raygun and rope device in your backpack and embark upon an adventure where you run, jump, drag, shove and laser your way through the ancient scenery. Tiny moves in a completely destructible and physically plausible environment. He‘s equipped with three basic tools to modify his surroundings, as a means to get to otherwise unreachable spots in the game, or slice and dice a level just for fun. He can use his mighty laser to cut and form any object at will. To move objects, Tiny can choose between a grappling hook to pull, and a rocket to push pieces into position. Of course, as the game proceeds, combining the tools gives the player a unique and sandboxy variety of possibilities to solve puzzles. 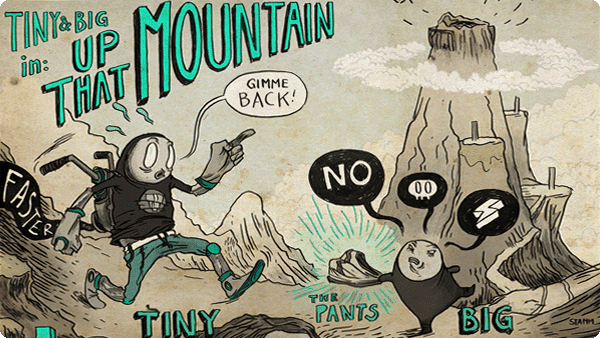 Up that mountain is Episode 0 and contains one level. Episode 1 ' Grandpa's Leftovers' is currently under development.